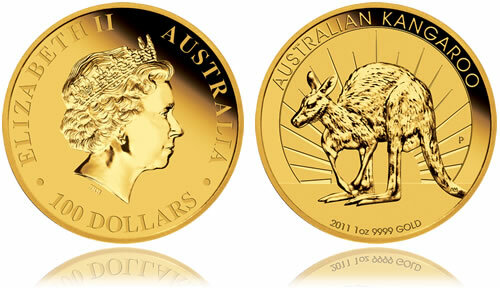 The Australian Kangaroo Gold Bullion Coin can trace its start back to 1987 when the Perth Mint of Australia first introduced the "Australian Nugget" series in both a one ounce and one-half ounce 99.99% fine gold coin. Since then, the series has undergone some changes, but it remains one of the most popular gold bullion products of the world. Whereas the first couple of years in the program saw reverse designs featuring famous gold nuggets (hence the name of the series), the 1990 strike was the first to contain an image of a kangaroo. Designs continued to alter over the next several years at times even containing images of wallabies and wallaroos. Finally, beginning in 2008, the Perth officially renamed the smaller sized strikes in the program to be a part of the newly titled Australian Kangaroo series. Today, the Australian Kangaroo series features annually changing reverse designs on the ounce and smaller coins featuring the marsupial for which it is named. The larger strikes also showcase a kangaroo, but their design remains static. Over the years, the Perth has struck several sizes of the coin ranging from 1 kilogram all the way down to 1/20 of an ounce. However, the most popular remain as the ounce, the 1/2 ounce, the 1/4 ounce and the 1/10 ounce with the ounce strike reigning supreme among them.